Now that you have your CPAP machine you will need to consider cleaning, storing and maintenance of your sleep apnea machine. First thing you want to consider is your daily and weekly maintenance, so you will want to come up with a cleaning routine, something that makes sense to you and works well with your schedule. 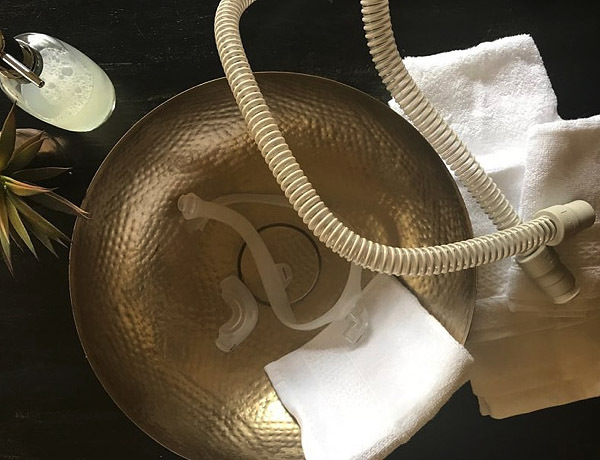 Cleaning your Sleep Apnea Mask daily along with your tube and humidifier in warm soapy water, rinsing it well and hanging the tube on a hook or over shower rod to let the water drip out and lay mask parts and water chamber on a towel to air dry is the easiest way to go about it. I suggest getting a door hook to hang over your bathroom door to hang your tube to air dry and it keeps it away from pets and kids who may want to play with them. Another thing to keep in mind is not to fill your water chamber while in it is in the machine which could cause water damage! Always remove the chamber from the machine before filling it and remember to use distilled water to keep mineral deposits from building up. I highly suggest having two tubes and mask so while one is hanging to dry, you have a fresh clean one ready to go which also allows you to have extra backup CPAP supplies on hand should you need them. Each week you will want to wash your mask head strap and chin strap in warm soapy water, rinse well and allow to air dry. Please do not put them in the wash machine or dryer. It is also a good idea to keep your machine dusted which I do weekly when I pull out the water chamber. I typically wash my water chamber every 2-3 days. If you use reusable filters for your machine, be sure to wash those weekly since they are the first line of defense for your respiratory system as well as filtering out debris like dust and animal dander. If the filter gets dirty it can cause your machine to work harder or decrease the pressure. Check your power cords monthly to make sure they are in good shape and replace your CPAP filters if you are using the disposable filters. As stated earlier, clean filters help keep your machine running and in good shape. Be sure to inspect your water chamber for cracks. Check your mask monthly as you may need to replace parts. One thing you may want to consider is a CPAP cleaning device that sanitized 99% bacteria from your mask, tube and humidifier. 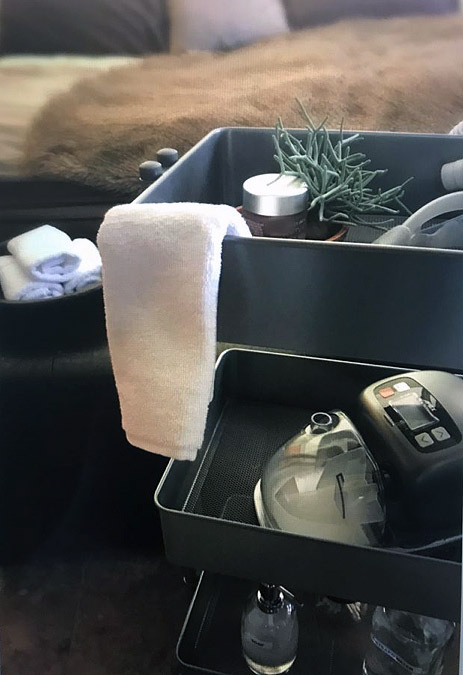 The one I like is the SOCLEAN which allows you to simply place your mask, attached to our hose and humidifier, in the machine and it will chemically free sanitize your Cpap mask, tube and humidifier without the use of any harsh agents. The SoClean uses activated oxygen to completely sanitize your equipment. Whichever way you decide to clean your sleep apnea equipment you will want to make sure, you come up with a plan and stick with it since your mask tube and humidifier can become a breeding ground for bacteria. As mention before, one of the important things to do to keep your machine running at top speed is to replace disposable filters every month and clean reusable filters weekly with tap water and replace every 6 months. You also want to replace your machine tubing every 3-4 months. Replacing your mask cushion and headgear every 3-6 months could help avoid the need to replace the full mask every 6 months and will help to avoid air leaking and loss of pressure. You can replace the mask frame as need but don't let it get distorted. Check your Humidifier monthly for cracks and replace it every 6 months. You don't want to risk cracks in the chamber which could cause water leaks in your machine which may void the warranty! Proper mask fitting is very important for your therapy. If your mask is not cleaned regularly it can build up oil and dirt and keep you from getting a good mask seal which could Keep your machine from blowing at the proper pressure and you not getting the airflow you need. Mask Liners could help you get a better seal on your mask and possibly help if you get a break out from the mask silicone. I have recently seen a lot of questions on some sleep apnea boards about how to store your equipment. There are several differing opinions when it comes to this question. Since some people live in a dryer, dustier area compared to those that live in a more tropical region your needs could be different. I suggest a hook that hangs over the bathroom door which works perfectly for hanging both your tube and mask to let it dry out and it does not seem to collect much dust this way. If your machine sits on your night stand it may attract a great deal of dust so other than your weekly dusting of the machine, you could opt to place a dust cloth over it when not in use or place it in a drawer. My nightstand has a dedicated drawer for all my CPAP supplies and I place the machine in there if I leave for an extended period to keep it dust free. I have seen nightstands specifically designed for sleep apnea machines. We now have a lot of options available to us. Whichever option you decide, should be easy and fit into your sleep apnea lifestyle to get the best therapy to fit your needs. You may need to experiment to see which options are best for you but once you come up with a plan and stick to it, your therapy and your machine will be better off!